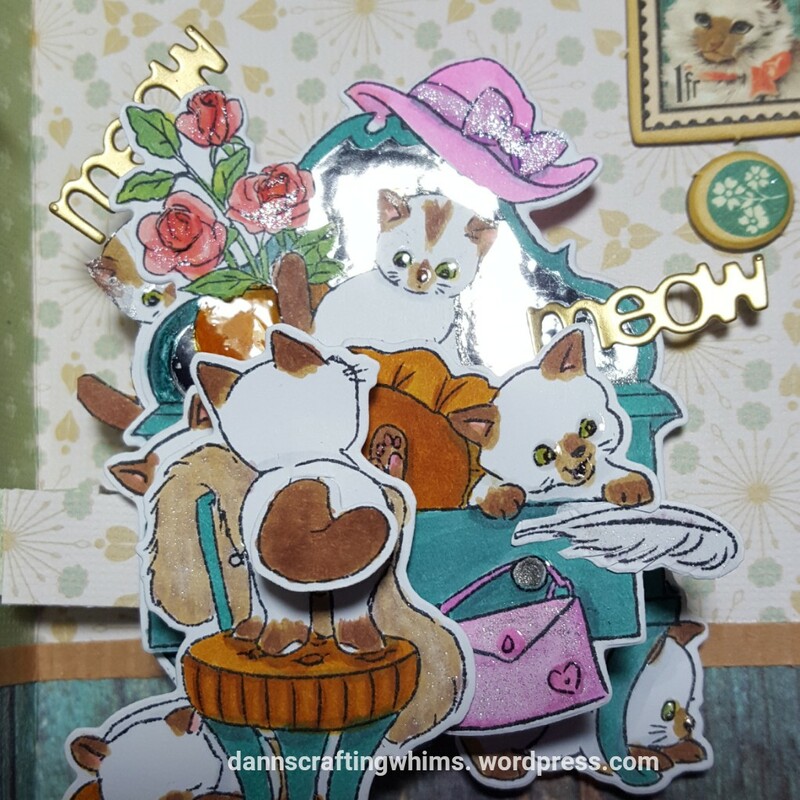 This entry was posted in 3D Cards, Cards, Friendship Cards, Papercraft, Pop-up Cards, Thinking of You Cards and tagged 3d card, Art Impressions 3D PopCard Template, Art Impressions PopCards Kitten Vanity, Art Impressions Window, ArtImpressions, cardmaking, Cat card, catlovershop2018, Copic Coloring, Copic Markers, DCWV, Graphic45, handmade cards, Interactive cards, papercrafting, Papercrafts, pop-up card, PopCard, Raining Cats & Dogs Graphic 45, Spellbinders Conversation Bubble 1 by dannscraftingwhims. Bookmark the permalink. Fantastic card! I LOVE this!! scene. I think this is the definition of animal antics. LOVE this!! Very creative. This is unbelievable and so darn adorable. I love all the details and that kitty standing up to bat at the roses makes me giggle. Oh my–this is so cute. I can’t believe the details on the inside. Look at that kitty in the window! This is darling! What a wonderful scene of mischievous kitties! Oooh! Be still my heart! WOW! the layering – its quite the window scene! JUST WOW! So talented! Totally pawsome!! I love it – and anyone would be so pleased to receive it!! its super pretty and so cute! Wow wow! I can’t close my mouth now, D.Ann!! Never seen such an amazing and super adorable interactive card. The kittens are so so cute and your in-room scene is amazing. How fun and delicate! I ‘m very inspired to CASE this design in the future. Thanks for sharing your card with us at Simon Says Stamp Wednesday Challenge!!! Wow!! This is amazing! So many elements and perfect little details and touches. Wonderfully done. Thanks for joining the Lost Coast Design Challenge! 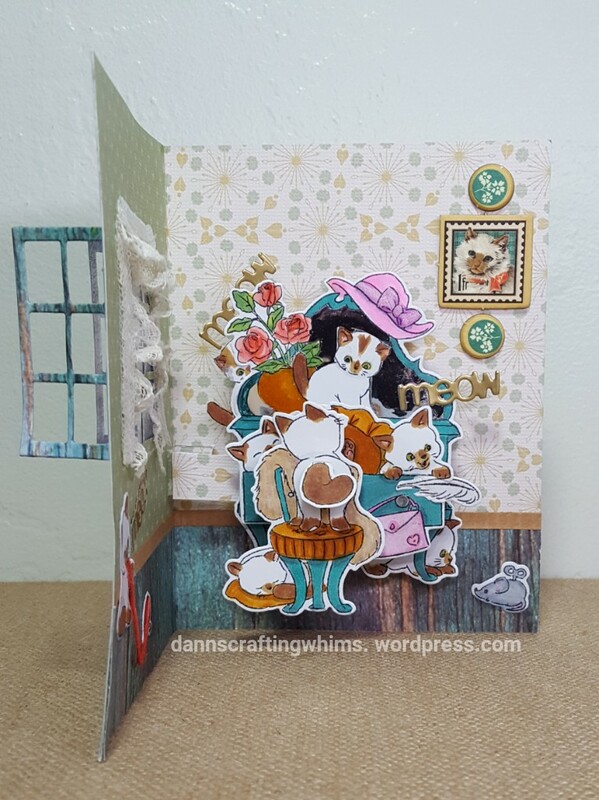 Such a beautiful card – love all of the kitties!!! Thanks for joining in the fun at Lost Coast Designs/Carmen’s Veranda!! 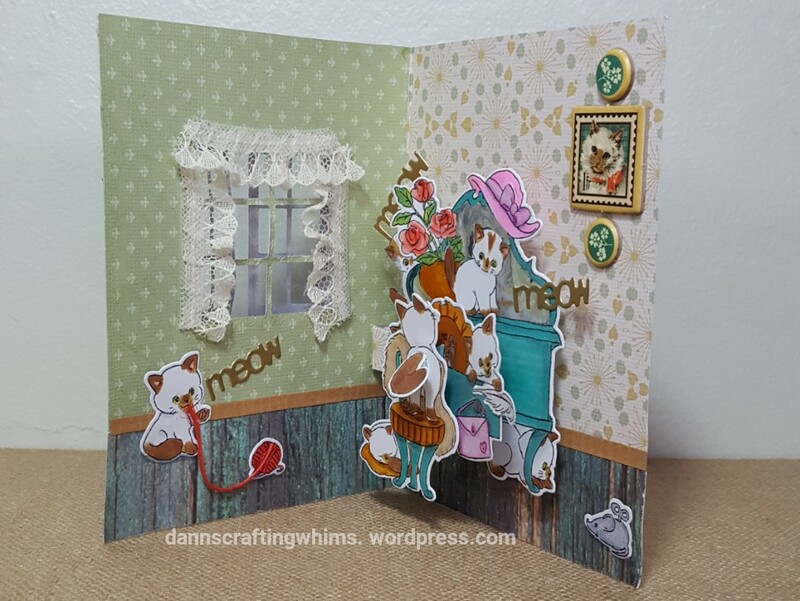 Fantastic pop-up, D.Ann! They always intimidate me when I think about making one but I adore them when others have made them. 😀 Adorable kittens. Oh, this is an old Cat Lady’s sitting room, for sure!!! 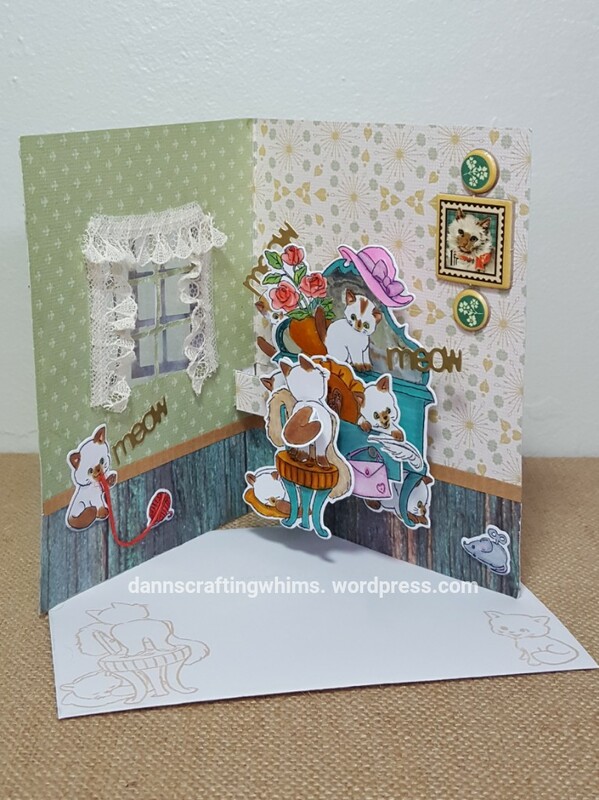 LOVE your card so much, D.Ann. Your beautiful details and creative designs always make your projects are real treat to see….and experience!! Beautiful work….love the lace curtains and the genius use of the G45 framed artwork!! And it was not lost on me that these are Siamese kitties…..such intelligent, inquisitive creatures….did I mention mischievous? lol… Just Purrfect! Wow! Wow! Wow! This card is stunning! I can’t get over the beautiful scene that you created! From the window to the curtains to all of the fine details! Wow! As a fellow card maker, I can appreciate all of the hard work that you put into your card! 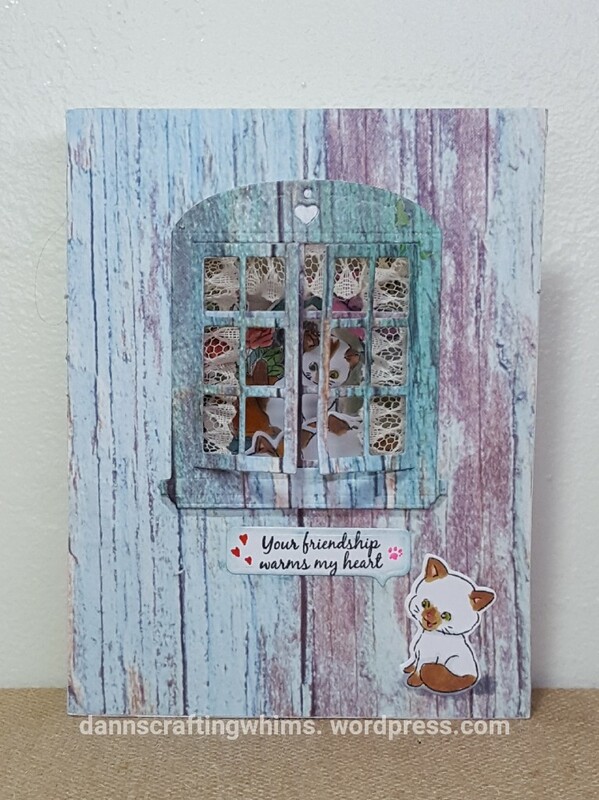 I’m just blown away by your card and can you tell how much I LOVE it! Whomever you’ve selected to give this card to is going to be one very lucky person and I’m sure that they will treasure it always! Thanks so much for being a part of the 2018 Cat Lovers Hop!!! OMGoodness, D.Ann!!!! This is a big WOW! I LOVE this card! My favourites are always the scene cards! This must have taken ages but well worth your effort! I love all the little details – I keep scrolling up and looking at it again and again! I don’t know how you will be able to give this one away – I don’t think I could part with it! I would have to keep it on permanent display! I haven’t been through the entire hop yet but I have a feeling this is going to be my favourite card of the hop! This one particular stands out to me!